*Produced on Order, Please contact for availability. Do you need to correct your caster due to your lift? everyone? No, if you're using your 80 series as a "rock buggy" you obviously have other concerns than how the vehicle handles and steers on the road, but for the vast majority of us that use our 80 as a daily driver, suspension geometry determines if our vehicle is a joy to drive or a pain in the rear. These bracket kits are designed to drop the fixed end of the OEM front control arms 2", 3" or 4 inches and bring the caster back to stock alignment and into the center of the designed travel arc. 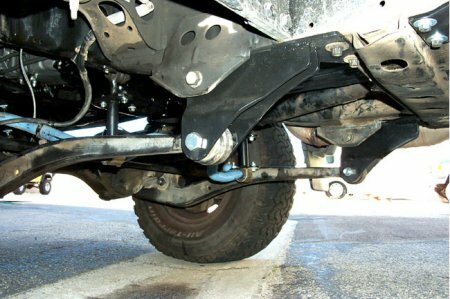 On vehicles w/2,3 and 4 inches of lift, stock bushings are retained in the control arms. On vehicles w/5,6,7,8 inches of lift, caster correction bushings or castor plates can be used in conjunction with these brackets to properly realign the caster. One big advantage of these bracket kits is installation requires no drilling, no cutting, no welding, up to 4" lift the control arms can stay attached to the front axle, no press is required, consequently they are much easier to install than any other caster correction option. Sold in pairs as a set. Please specify your drop required when ordering: 2, 3, or 4 inches.